Housed in an old gas station, Leo's Barbecue in Oklahoma City offers plenty of charm and delicious food that will have you coming back for more. Oklahoma barbecue is known best for what it isn’t: not exclusive to one kind of meat, not as vinegary as some or as saucy as others. Instead, Oklahoma barbecue hits the mark, striking a perfect balance between other famous styles. Take a tour of Oklahoma’s barbecue standouts by visiting one of the BBQ hotspots listed below; and don’t forget to bring your appetite – you’ll need it! Van’s Pig Stand, or simply Van’s as it’s known to locals, began in Shawnee and has since spread to neighboring Norman. The original Van’s is located in an old service station and has a vintage feel to it, while the newer restaurants each have a personality of their own. Despite the decorating differences, Van’s Pig Stand makes the list because of their perfectly smoky and spicy barbecue sauce that is mouthwatering on its own. Add a drop of it to Van’s perfectly smoked ribs, which have just the right amount of char outside and pink, tender meat inside, and you’ll be hooked. Make your meal “a Van” and they’ll throw in a side of their famous curly fries, many of which stretch over a foot long. Anyone driving along Highway 77 in Davis can smell Smokin Joe’s Rib Ranch a mile away. This no-frills barbecue joint is so sought after they had to move to a larger location to accomodate all the hungry customers. While the ribs are what the restaurant is named for, don’t be shy about trying brisket so tender you can cut through it with a plastic fork. Smokin Joe’s helpings are big enough to share, but so good you won’t want to. Pull into the parking lot of Burn Co Barbecue and you'll know you're in for a treat from the amazing smoked meat smell in the air. This one-of-a-kind Tulsa BBQ joint serves traditional and unique barbecue dishes and everything on the menu is guaranteed to satisfy. Every item at Burn Co is cooked over hardwood charcoal in a Hasty Bake Charcoal Oven for amazing smoked flavor. Their most famous menu item is the Fatty, a mixture of bratwurst, hot links and smoked sausage encased in ground sausage and wrapped in bacon. Smoked, braised, grilled, rubbed or smothered with sauce, Oklahoma’s top barbecue restaurants are waiting to serve up some tasty ‘que. Don’t let the trendy side of Iron Starr Urban Bar-B-Que scare you away from experiencing first-rate barbecue in the state’s capital. Small touches, from the atmosphere to the food, help place this Oklahoma City restaurant on the list of top barbecue joints in the state. The décor is upscale cowboy with a copper-hammered bar, dark wood floors and studded leather booths. The ribs are juicy with very little fat, and come served with hot, damp towels and a lemon wedge. The natural smoked turkey is always a crowd pleaser and comes with a choice of two sides including whole fried okra, fancy mac and cheese, seared green beans and Dutch oven sweet potatoes, which are good enough to write home about. Iron Starr also offers a wide selection of Made-in-Oklahoma beer. For premium meats and ingredients cooked the old fashioned way over hickory and pecan wood, head to Mac’s Barbeque in Skiatook. For over three decades, this small barbecue joint has been offering big flavor in northeast Oklahoma. While some of the most popular picks include a hearty three meat combo and pork spare ribs, hungry diners will also find unique entrees like the barbecue Frito pie, which combines chips, chopped beef, barbecue beans, diced peppers and onions and shredded cheese. In addition to the homemade rub used on all the barbecue, Mac’s also produces their own award-winning sauce made fresh each week. Housed in a quirky cobblestone cottage, Bob's Pig Shop in Pauls Valley offers up lunch and dinner in a rustic atmosphere complete with wood paneling and a mix match of booths and chairs. What they lack in ambiance, they make up tenfold with food. Open since 1933, Bob's Pig Shop has withstood the test of time including the Great Depression and World War II. Stop by today to taste the pig sandwich, a local favorite that comes with thin sliced pork and barbecue sauce served on a fluffy bun with a side of beans and crispy pickle. With nearly 80 years in the making, you’re sure to leave satisfied after a stop at Bob’s. Dink's World Famous Pit Bar-B-Q, known to local Bartlesville residents simply as Dink's, offers heaping helpings of brisket, ribs, pork loin, bologna, turkey, sausage and chicken seven days a week. With decades of culinary experience, the staff at Dink’s expertly prepares the meat in an outdoor pit filled with hickory wood, which produces a juicy, smoky concoction of irresistible flavor. Balance out the savory with a splash of Dink's homemade light, sweet barbecue sauce. Few things go together quite like barbecue and football. Both are celebrated with vigor at Ray’s Smokehouse BBQ in Norman, owned by former University of Oklahoma and New York Jets player Darrol Ray who has been serving up the good stuff since he opened his doors in 2008. Like any good barbecue joint, ask three different people what you should order from Ray’s and you’ll get three different answers. So why not cover your bases and go with the three-meat combo? Feast on chopped or sliced brisket, smoked low and slow to perfection, paired with delectable offerings like ribs, hot links, pulled pork and other favorites. While the meats are the star of the show, Ray’s excellent sides likes collard greens, mac and cheese, potato salad and fried okra deserve plenty of fanfare as well. Get your fill, but try to save room for a generous slice of Ray’s homemade chocolate, lemon or strawberry cake to round out your meal. Drop by this family-owned institution and see why it’s a favorite among football and barbecue fanatics alike. In 1945, Donovan 'Uncle Bud' Head had just returned to his Oklahoma home from serving as a cook on a naval destroyer in WWII. He brought with him recipes he whipped up aboard the ship using simple, wholesome ingredients. One of the recipes was a barbecue sauce that was an instant hit with everyone who tried it, thus Head Country Bar-B-Q sauce was born. The folks at Danny's BBQ Head Quarters in Ponca City put just as much thought into how the meat is prepared, so go expecting slow cooked meats served by themselves or as a sandwich with a side of pickles and onions. Afterward, take home a bottle of Head Country, which comes in original, hickory smoke or hot. Jigg's Smokehouse in Clinton has been an Oklahoma favorite for over three decades, made famous by the sheer amount of food that precariously teeters on five-inch buns. The king of the castle is the wooly burger, an insane spread of nearly two pounds of hickory smoked ham, seven slices of beef summer sausage, cheddar cheese, mayonnaise and chow-chow relish. Even the heartiest carnivore will have a hard time devouring this monster. While the vast amount of meat ups the wow factor, Jigg's barbecue sauce is the perfect complement to the meal for its smooth, sweet and smoky flavor. Sooner Legends in Norman is a one-stop shop for out-of-towners for its mix of lodging, entertainment and food. Famous for its OU theme that pays tribute to the nearby University of Oklahoma and its winning college football team, Sooner Legends serves generous portions, USDA 21-day aged beef and scrumptious barbecue. Though Sooner Legends has expanded its menu, its roots are firmly set in barbecue, as the restaurant originally began as Bob’s BBQ in 1999. Some delicious options remain from the early days like pulled pork sandwiches, fried corn on the cob and the popular macaroni and cheese. Finish your meal off with a hefty slice of red velvet cake, which pays tribute to OU’s classic crimson and cream colors. Wild Horse Mountain Bar-B-Q is a family owned and operated barbecue joint that has been serving up heaping helpings of barbecue beef, pork ribs and hot links for over 20 years. Pair your meal with a side of their famous barbecue beans, which come slightly peppery with bits of onion and tender meat mixed in. Afterward, check out the newspaper articles, funny signs and autographed pictures of famous people who have also discovered this hidden gem of a restaurant tucked away on Highway 59 just south of Sallisaw. 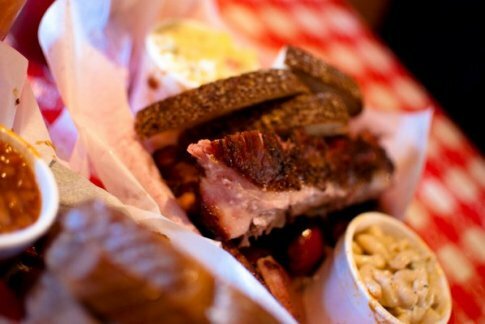 Since being featured on the Food Network's popular TV show 'Diners, Drive-Ins and Dives' with Guy Fieri, Leo's Barbecue in Oklahoma City has been discovered by the masses, but that hasn't changed the top-notch quality and generous quantity of food that hungry diners have come to expect. Satisfy your appetite with Leo's Special, which comes with a sampling of ribs, thick-cut bologna, chopped beef and hot links paired with two sides. Save room for dessert because each meal at Leo's comes with a complimentary slice of their famous strawberry-banana cake. Jake's Rib in Chickasha is known for delicious food and plenty of it. Stop by this local favorite to feast on their namesake spare ribs as well as succulent sliced beef, smoked sausage, juicy steaks and more. Jake's Rib features a smorgasbord of sides, and the popular curly fries are big enough to feed an entire family. Or, kick up the spice a notch with their pepper puppies, which are miniature versions of jalapeno corn bread. Loosen your belt and make the trip to Jake's Rib next time you're in Chickasha. Plenty of places might lay claim to the title of best barbecue in central Oklahoma, but the Butcher BBQ Stand in Wellston has the accolades to back it up. This dining destination has been racking up awards and satisfied diners since it opened in 2015. After an impressive 30 years on the compettitive barbecue circuit, the Butcher BBQ team opened its permanent dining location on Route 66 after bringing home more than 400 first-place ribbons, being named the 2012 World Food Champion in Las Vegas, and even appearing on the BBQ Pitmasters TV show. Enjoy all your barbecue favorites like pulled pork, tender smoked brisket—don't forget the burnt ends!—and succulent, St. Louis-style ribs in a no-fuss, outdoor environment complete with a giant Jenga game set, a horshoe set-up and live music performances. Don't be fooled by the size of this southwestern Oklahoma barbecue joint. John & Cooks Real Pit Bar-B-Cue may be small on the outside, but the flavors found within are massive. Come feast on classics like ribs, brisket, pulled pork, hot links and more, smoked low and slow to perfection. Get your choice of 100% woodfire-smoked meat(s) piled high on a sandwich, on a plate with baked beans and coleslaw, or take it home by the pound. Save room, if you can, for one of John & Cooks irresistable desserts like their famous lemon cake or sweet potato pie to truly complete the experience. However you do it, you'll definitely be glad you made the trip to Lawton for this can't-miss barbecue hotspot that's been around for more than 90 years. Nothing brings people together quite like barbecue. Bedlam Bar-B-Q in Oklahoma City may take its name from the intense rivalry between OU and OSU, but everyone who eats here can agree on one thing: Bedlam does it right. Since 2003, this beloved barbecue joint has brought together smoked meat fanatics of all allegiances over platters of sliced or chopped brisket, delectable smoked turkey and ribs that fall right off the bone. Order up with a side of collard greens, cowboy beans or mac and cheese and you'll forget about any outside rivalries in no time. For a complete list of Oklahoma's heavenly barbecue hotspots, along with special deals and events, click here.